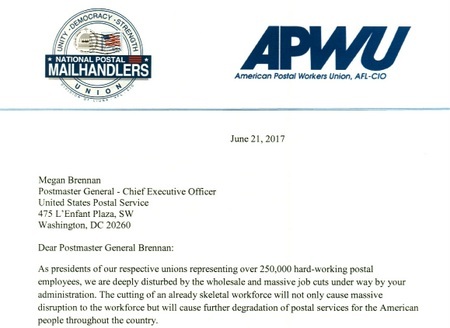 The postal unions have drawn a line in the sand and are standing united against Postmaster Brennan’s continuous “cost-saving” shortcuts – shortcuts that have greatly affected not only the bargaining-unit workforce but also mail processing, mail delivery, customer service and the reputation of the United States Postal Service. The letter concludes with an offer to meet and explore alternatives to the proposed massive cuts that will preserve service and jobs. Click here to view the full letter.